Peter Donovan was the longterm, faithful and skilled coworker with Brother Adam at Buckfast Abbey in southwest of England. 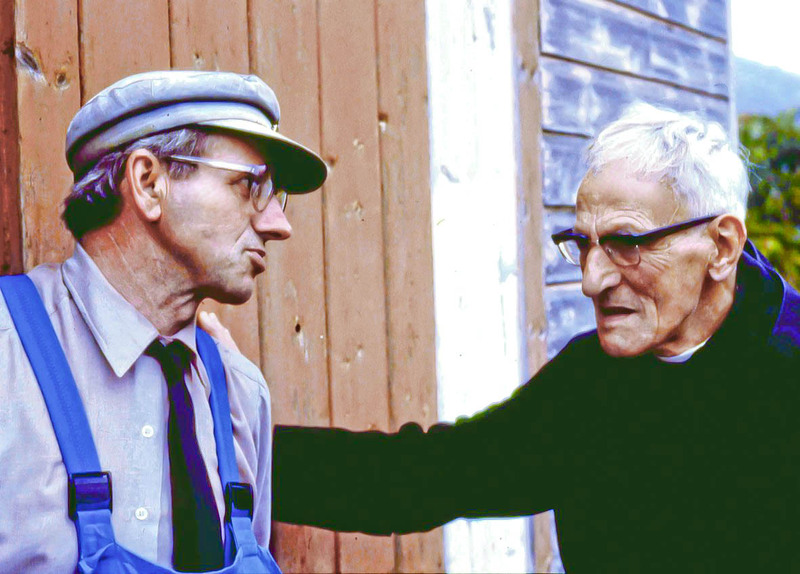 He came to the abbey 1939 at the age of 12 when the war started and helped Brother Adam in his work with the Buckfast bee. Already here he started using his typical tie, always with him during work. Later he added the blue cap. During his military service he was stationed in the far east. When he came home he returned to the bee departement at the abbey to work for and with Brother Adam. 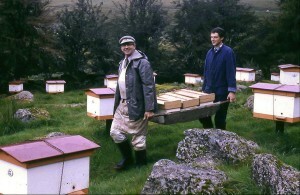 Carrying mating nuces from the mating station Sherberton on Dartmoor, here together with J. Knoblauch. Brother Adam had other persons working for him during the years as well, both munks and non munks. 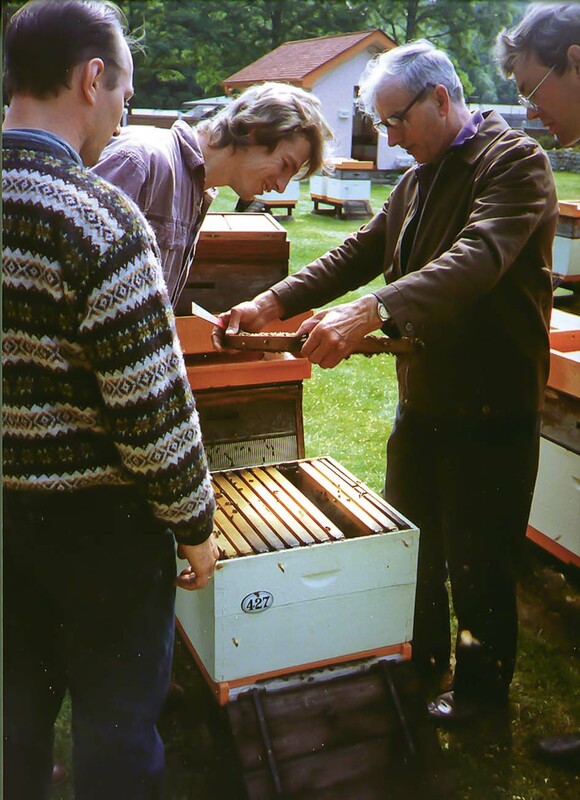 When Brother Adam died Peter continued his work developing the Buckfast bee, testing and refining new combinations of subpopulations (races) of bees, until several years after his retirenment age. 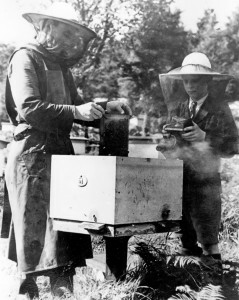 Inspecting colonies in the home apiary showing visitors from Germany possible breeding candidates. Peter Donovan was highly appreciated as speaker at conferences. 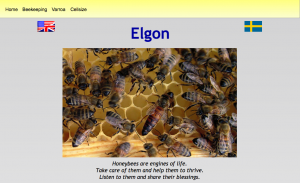 We invited him to Bee-85 in Sweden together with Brother Adam and Steve Taber. He has been to Germany and Canada, not the least to many bee clubs in Great Britain. In his later years he helped the Canadians to build up their Buckfast strain of bees. 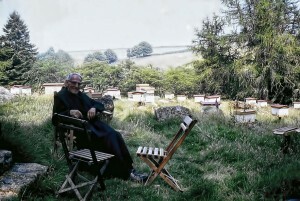 He also collected material to publish an instructional DVD about beekeeping at Buckfast Abbey. Let’s hope it will be published one day. Today the Bee Departement at the Abbey mainly produces honey for sale at their gift shop. When John, his son, phoned me I reacted with great sadness. I had learned to know Peter during many years and appreciated his upright and humorous personality. We kept in touch during the years, from my first visit in 1983. The funeral ws held by the abbott at the monastry December 16 and he is buried at the monastry. Chief mourners, his wife Grace and son John. Peter Donovan, born 1927 Aug 27, died 2013 Dec 3. This is a too long story to be told in one post here. But I have to start somewhere. I first visited Brother Adam and Buckfast Abbey in 1983. 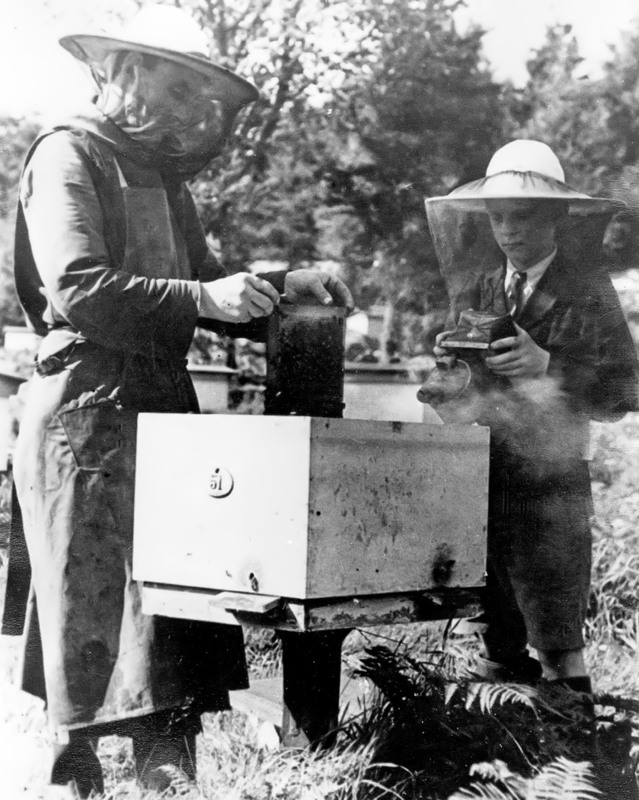 I was allowed to look into his pedigrees for his bees and his world of beekeeping started to unfold. I returned several times. I learned his way of breeding, brought breeding material back to Sweden. In the picture he is sitting in his mating station at Shirburton up on Dartmoor, with his six drone producing colonies and all the mating nucs with virgins or newly mated queens. And those that didn’t copy his way of for example mate the virgins and still call their bees Buckfast were looked upon with suspicion. They weren’t true Buckfasts. And no one asked Brother Adam what he thought about it. 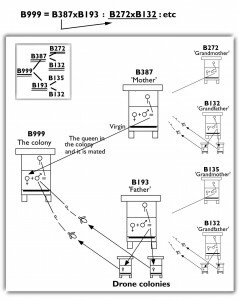 But he supplied all those that wanted breeding material, including Weavers in Texas, who didn’t used isolated mating stations the way Adam did. Now Adam is dead so we can’t ask him. But I ran into a hobby beekeeper who visited Brother Adam in 1981. 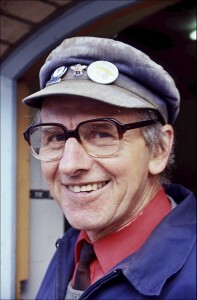 Hans Samland, now a retired firefighter, was humble enough to ask him what he thought was the best way for him as hobby beekeeper with 15 colonies to do his breeding work. Adam knew of the Swedish Buckfast breeding program with isolated mating stations with material from Buckfast. Adam didn’t even suggest Hans to start with imported bees from him. He didn’t say anything about that. He just answered Hans’ question. – Every year you decide which half of your bees is the least good one. In those colonies you shift queens. 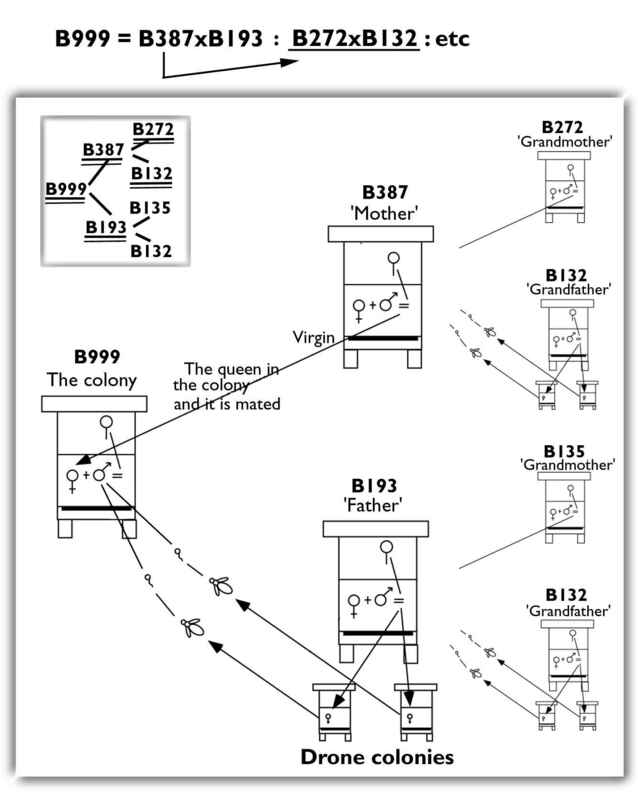 You get the queens to put into those colonies by making a daughter queen from each and everyone of the colonies in the best half of your colonies. Let the new queens mate in your apiary. It’s simple and it was the best way for Hans, according to Adam. Was Adam right? Probably!